The tale follows a month in the life of Will Stanton, beginning at the Winter Solstice, when he begins to notice spooky and mysterious things happening to and around him. Conflicted by the longing for childhood and the duty to keep those around him safe, he embarks on a quest full of ancient magic where evil lurks, and learns to use the Dark inside of him to vanquish those who wish him harm. Re-reading this as an adult makes me realise modern literature for younger readers pales has been "dumbed down". 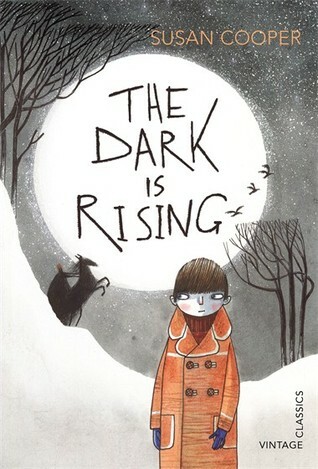 I must have been around my daughter's age when I read The Dark is Rising the first time; now the language and allusions presented appear much more complex and "grown up" that I would have expected from a pre-YA novel. I did enjoy it, but at the same time was perturbed by a feeling of melancholy, perhaps due to the setting and stark descriptions of folkloric scenes. For this reason, although it is considered a classic of children's literature, I hesitate giving Cooper's novel full marks.